Most images we make in photography seem to end their short lives with the overly worn “Delete” button on the backs of our cameras. Why? This entertaining 1.5 hr lecture and slide presentation explores the thought process and mechanics behind visual design and compositional techniques – why they work and why they sometimes fail. 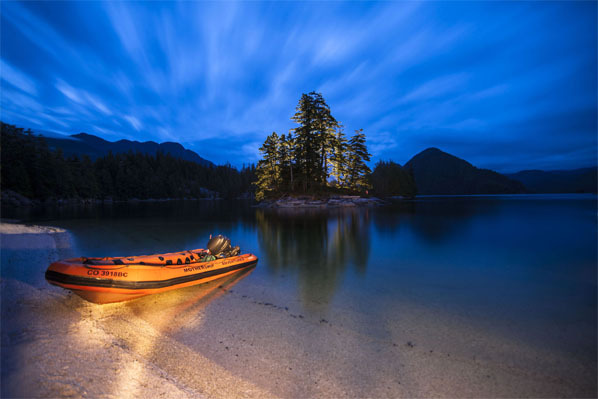 Facilitator Boomer Jerritt will use his compelling images to provide thought provoking information for the beginning and advanced photographer alike. “Before Television” is a newsletter feature that shares the Courtenay and District Museum collection with readers and highlights the ingenuity and creativity of people as they added beauty and personal style to items from their home and work life. 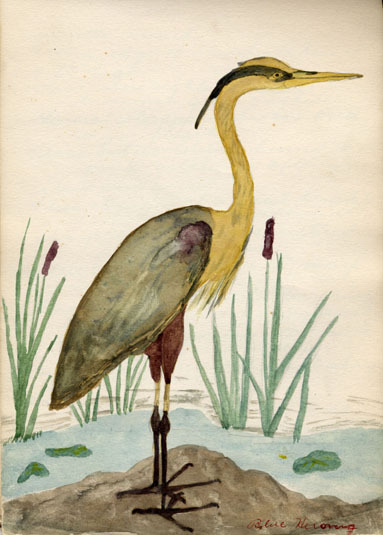 This painting of a blue heron is from an instruction booklet created by Rose Baikie (later Rose McKenzie) when she was a teacher in the Comox Valley. Rose carefully painted images of a dozen local birds and gathered facts about their habits to share with her students. Rose (b. 1906 – d. 1979) spent her first years of teaching at the McGuigan School (Camp 3) in the 1920s. She also taught at Lazo School and Comox Elementary before marrying William Samuel McKenzie in 1927. Rose left teaching until 1957 when she returned and taught again for 13 years before her retirement. 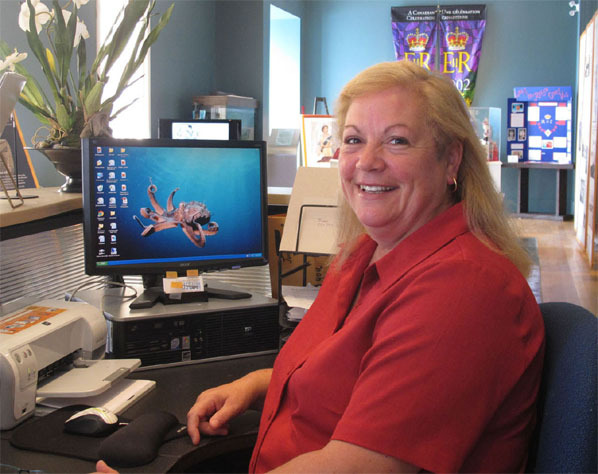 Gillian Miller started her position running the visitor services at the museum in June. She enjoys the daily variety of work that the position offers. Never before has she sewn eyes on a dinosaur outfit or fed live worms to an African Lung Fish! Gillian’s hometown is Brighton, England. She has been fortunate enough to have lived and worked in London, Vancouver, Washington DC, and Cape Cod. Gillian moved permanently to Vancouver in 1986 where she married and worked in credit card services for a major credit card company. Gillian has worked at numerous other occupations, everything from being a nanny, Montessori teacher, manager of the Chemainus Chamber of Commerce and Visitor Centre and working, marketing and sales at a winery in Cobble Hill. On Vancouver Island, Gillian has lived in Sooke, Chemainus, Courtenay and, a year ago, moved to her funky Royston home where she lives very happily with her Bascottie dog, Gertie. Gillian feels that the Comox Valley is the best place she has lived and loves working with all the dedicated staff at the museum. 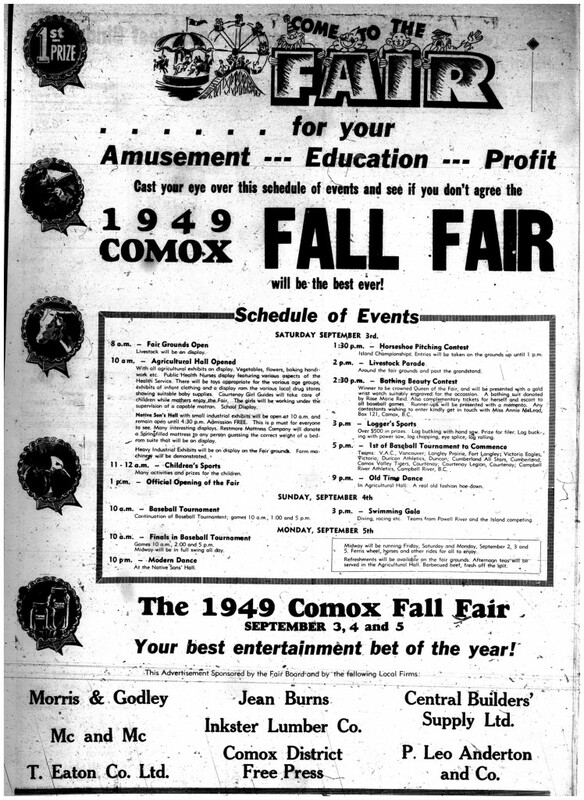 How does the Fall Fair of 1949 compare with today’s Comox Valley Exhibition? Check out this advertisement from the Comox District Free Press of August 25, 1949 to count the ways! The first school in the Comox Valley opened on Mission Hill in 1871. 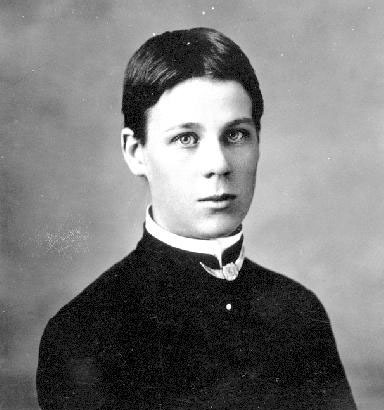 The first teacher was S. F. Crawford, who divided his time between farming and being a schoolmaster. After 10 years, Crawford moved on to open the school on Denman Island. Crawford’s successor in 1882 was Agnes Deans Cameron, a young woman, who came with good recommendations, high ideals and strong opinions. She had been the first girl to graduate from Victoria High School, and was a fully qualified teacher at 16. At just 18 years old, Aggie Cameron already had two years of teaching behind her at the Angela College for girls, a private school in Victoria, run by the Church of England. Her new home was with the Robb family who lived at Comox Landing, and that meant each morning and afternoon she was faced with a 4 mile walk along the Estuary and over the rickety and wind swept Long Bridge which spanned the water before the Dyke Road was built. Tall and slender, her vigorous stride and uncommonly short hair caused some amusement for the K’ómoks people from the vantage of their village. She shared the joke as they greeted her each day. Little else is known about Agnes’s short time in Comox but when she returned to Victoria in 1883 her reputation developed quickly as an extraordinarily good teacher. She quickly distinguished herself as the first female teacher at the Victoria High School, and by 1893 had become the first woman in British Columbia to be the Principal of a co-educational school. She was intensely interested in the theory and practice of education, and was frequently a speaker in educational circles. Many of her ideas are not dissimilar to those current among today’s educators. She believed in giving students a broad based liberal education, which instilled self-esteem, good citizenship and a sense of responsibility. Unlike many of her contemporaries, she down played the need for vocational training at an early age and instead emphasized the importance of giving her students the tools necessary to become analytical and critical thinkers, and problem solvers. Perhaps most surprisingly for her time she promoted the idea of treating each student as an individual with his or her own strengths, needs and potential. Not surprisingly, such an intelligent, clear thinking and forthright woman was bound to run afoul of the authorities, and she fought several very public battles with her superiors and elected officials. The final straw came in 1905 when she permitted her students to use rulers on the free hand drawing examination. Although Miss Cameron had many supporters, this was the breaking point for the School Board, and she was dismissed. A public uproar forced the appointment of a Royal Commission to investigate the matter. Miss Cameron refused to admit her error and the Commission supported the decision of the Board. At first, she was inclined to continue the battle, and she ran for a position on the School Board, which she won, by a large margin. With the decision of the Royal Commission, her teaching career, however, was over, and Agnes turned to writing and her many other interests and causes. She was a passionate crusader for women’s rights, including suffrage and pay equity. She belonged to the Woman’s Christian Temperance Union, the Society for the Prevention of Cruelty to Animals, the Local Council of Women of Victoria and Vancouver Island, the Dominion Women’s Enfranchisement Association, and the Children’s Aid Society. Each of these organizations gave her a platform for her ideas of social justice and equality. Having made the decision to become a journalist, Agnes became a member of the Canadian Women’s Press Club. She wrote extensively for several journals and newspapers, and was engaged by the Dominion Government to promote the settlement of the Canadian West. In 1908 she set out with her niece to explore the far north and they became the first white women to reach the Arctic Ocean overland. Daily she wrote about her experiences and recorded images with her camera. She was able to describe unknown regions around the McKenzie Delta, the Athabasca River and Great Slave Lake in great detail, and her observations of the lives of Inuit and First Nations people were sensitive and meticulous. On the strength of this adventure she published a book, The New North, and subsequently lectured extensively in North America and in Britain. When she returned to Victoria at the end of 1911 she was welcomed as a celebrity with wide coverage in the press and a civic reception. 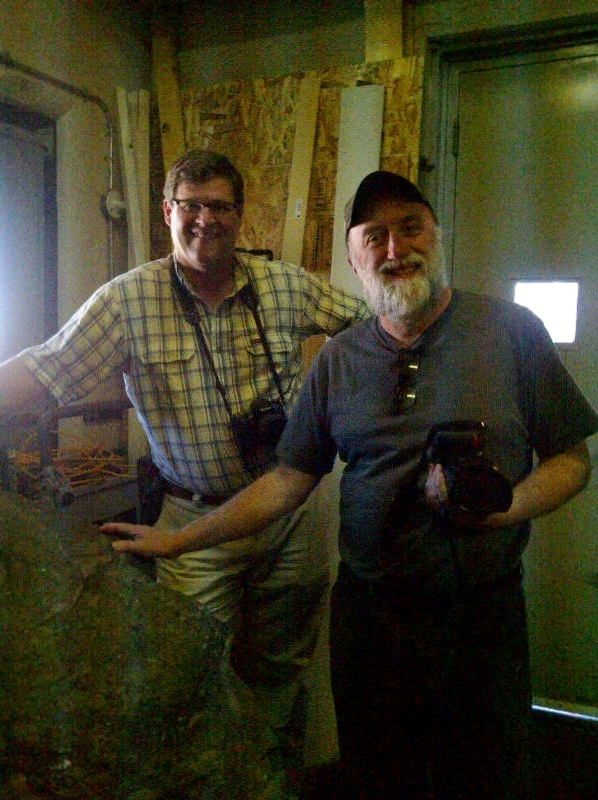 Left to Right: Kirk Johnson, Chief Curator and Vice President for Research Collections at the Denver Museum of Nature and Science and Ray Troll, renowned artist. Courtenay and District Museum blog Discoveries Happen is where you’ll find ongoing information about museum events, visitors, tours and programmes—welcome! We’re starting off the blog with a pleasant surprise visit this morning from Kirk Johnson, Chief Curator and Vice President for Research Collections at the Denver Museum of Nature and Science and renowned Artist, Ray Troll. Troll and Johnson are co-authors of Cruisin Along the Fossil Freeway a book and CD about “fossils, fossil finders and their stories”.